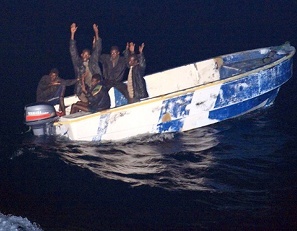 Brazen Somalian pirates got a little more than they bargained for the other day. A ship that they believed to be a big, fat oil tanker just waiting to be taken over was an oil tanker, in a way. The ship, La Somme, was actually a refueling ship for the French Navy. Once they realized their mistake, the two pirate skiffs turned tail and ran, but those five gents you see in the picture weren’t able to escape and were captured after an hour-long chase. The ship was in the Gulf of Arden as part of Operation Atalanta, the European Union’s anti-piracy action off the coast of Somalia, where piracy is a constant worry. Maybe this is a new tactic for the anti-pirate forces; take a combat ship and disguise it as a simple cargo ship. When the pirates come to pillage, you drop the hammer on them. Ingenious, France!